He gave an example of his most famous novel – Remains of the day. The idea can be expressed as: This is a story about a man who wants to be the perfect servant. And he is willing to sacrifice his personal life and many things to be an absolutely perfect servant. The point is, the essence of an idea can be expressed in a simple way in a few sentences. And yet it may carry the potential to excite you, trouble you etc. 2. Ideas can be re-located in time & space: Ishiguro says, “I made this discovery… The setting isn’t an essential part of the story. You can move stories to different settings, different places in history. And also I suppose different genres: sci-fi, gothic world, thriller world etc.” In fact, for his third novel, Remains of the day, he re-used his idea from his second novel - “The artist of the floating world” (location: Japan, time: 1950s, 60s) and relocated it in a different time and place (location: England, time: 1920s, 30s). This creates a huge canvas for his stories and also it creates a problem of “location hunting”. His last novel “The buried giant” is placed in 5th century Britain and belongs to a fantasy genre. It contains ogres, pixies and dragons. 3. Metaphor as a criterion: One criterion Ishiguro applies in selecting an idea for further development is by looking at its power as a metaphor. 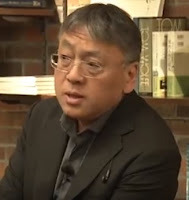 Ishiguro said, “As a writer, I am drawn to big metaphors that dominate the entire story. One of the ways I decide if an idea is powerful or not, is I ask - Is this a powerful metaphor for something important or something very big?” For example, he mentions his latest novel The buried giant presents a story where people lose memories very fast – in a day or so – because of the breath of a giant dragon living in the mountains. Some people want to kill the dragon to bring the buried memories alive, some others want to protect the giant because they feel it is keeping the society from going into a civil war. What is the right thing to do? Ishiguro feels that a story like this can be a metaphor for something all individuals and all societies face all the time. The metaphor is certainly relevant for the centuries old memories related to the communal conflicts and the caste conflicts in India which keep getting resurrected from time to time. In short, writing the essence of the idea in 2-3-4 sentences, trying to relocate the idea in different time and space, using the power of metaphor as a criterion for idea selection are things any of us can try and experiment with. I certainly will.